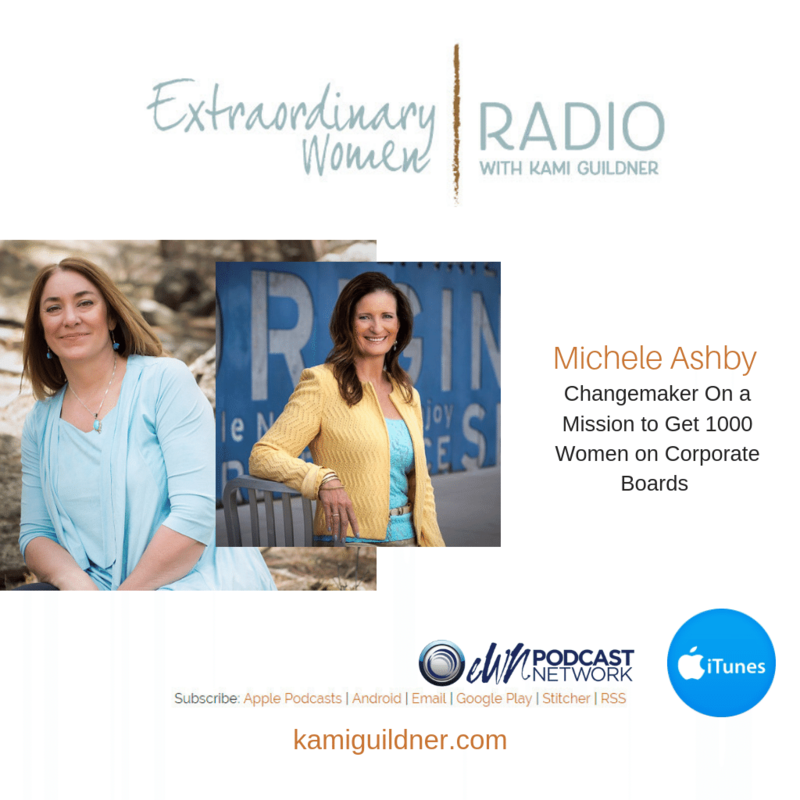 Today’s Extraordinary Women Radio guest is Michele Ashby, a woman on a mission to get 1000 women placed on corporate boards. She is the President and Founder of ACE LLC (Ashby Consulting Enterprises) & CDI LLC (Corporate Directors Int’l). Currently, there are only 2 women for every 10 board seats sitting on corporate boards across the US and Canada. Michele is on a mission to change this – to bring that ratio into a 50/50 balance, and to do it in a much faster timeline than that of our current trajectory of change… which, as she shares with us in this interview, would take 70 years! I believe in her work. We talk about her personal journey to public boards – working in two male-dominated fields – mining and finance. Michele has served on six corporate boards over 18 years and is currently an Independent Director for McEwen Mining Inc., MUX:NYSE, and MENE Inc., MENE:TSXV, as well as a subject matter expert on corporate boards, a key note speaker and an executive business consultant. She interviewed 200 women over 18 months and has found the gaps that can keep women from achieving board status, and this research became the foundation for her ACE Board Training For Women – with the goal of training 1000 women for corporate boards and the Corporate Directors Int’l Board Certification Exam, which certifies candidates for Corporate Board service. Her program teaches women how to get on boards, how to behave in the board room and financial and legal acumen. It also teaches women how to build their board resume – which is very different than a traditional resume, translating your experiences into the executive vernacular. Michele is an author of 3 books and a former ultra-athlete. Michele is the first woman in North America to row 24 hours on a Concept 2 rowing machine – a total of 211,036 meters in 24 hours. Most recently, Michele was named as one of the Top 25 Most Powerful Women in Business in Colorado for 2019 by the Colorado Women’s Chamber of Commerce. Ms. Ashby has extensive non-profit and trade association board experience. Michele also founded Dani’s Foundation, in memory of her daughter, Dani Stell, which contributed over $1 million for Ewing’s Sarcoma cancer research over 15 years. She has also served as a Board member and Chair of the Board of the Oncology Board at the Children’s Hospital Colorado. To learn more about Michele Ashby, you can follow her on her web site: www.acellc.consulting or follow her on LinkedIn.